OrecX offers the most affordable, easy to install, maintain and use open source call recording software for contact centers and communication service providers. 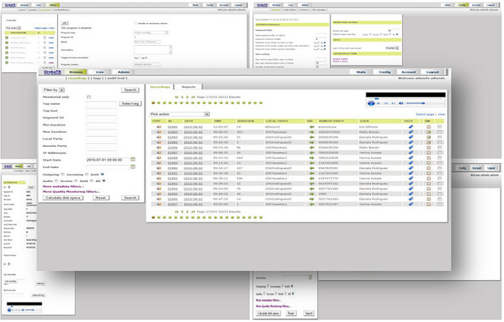 (including screen activity video) with an option to only capture a sampling of calls for quality monitoring purposes. Quickly and easily search millions of calls by any parameter. Record calls on-demand and allow specified users to listen-in live to select calls. Everything that goes on in the system is tracked with timestamps. You will know who did what and when they did it. An at-a-glance view of calls-per-day, call duration, active calls, total number of recorded calls, and more. Add notes or tag calls with bookmarks & categories for easy searching. Product can easily be re-branded to match the client's branding. "We were looking for an affordable, carrier-grade call recording solution and we found one in OrecX. I can now say for sure that I am a raving fan of the OrecX product and customer support." "It's really easy to find a call. Our team simply types in the individual's phone number and there it is. We can also search by ID number, time of day, duration of interaction and so on." "We have been using Oreka TR for many years and are very happy with the product. Call recording has to work 100% of the time and Oreka TR does. And it does not require a lot of administration. The setup is straightforward and once complete other than watching your disk space you can pretty much forget about it.We operate a call center with upwards of 500 simultaneous calls and we record both the audio with Oreka TR and the Call Center Agent's screens with Oreka SC. We are planning on expanding to 1,000 simultaneous calls next year and we are confident Oreka TR will easily handle the volume"
Oreka TR is a full-featured VoIP-ready 100 percent recording solution that can record VoIP, RoIP and TDM on the same server - try it free for 30 days! Recordings can be indexed by time, employee, date, group and more! © 2018 OrecX. All Rights Reserved.